I haven't finished all my modelling/texturing for my scene yet, but I have decided to light it so I have a better idea of what my final result will look like. 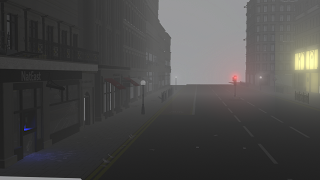 Since my first concept I wanted the street to be very foggy and the distant view obstructed, so I've been looking into the enviromental fog in Maya. My first attempt was to have one building lit, as if to suggest there is still life, but this could also mean that the power is still on but the building is desolate. The glow is a bit high in this image, I'm still fiddling with that. I next tried using the enviromental fog in the Maya Software render settings. It came out looking very weak, I tinkered with the settings for some time, but it still seemed to just look like an overlay on the image. 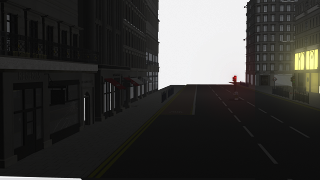 I also found, that Mental Ray's render options has no Enviromental Fog settings, but if you create it in the 'Maya Software' render options and then render in MR, it keeps the fog. 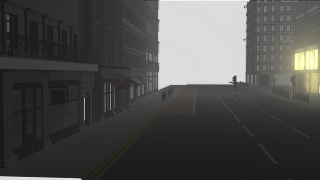 The grey background will be Matte a painted after the finished render to create distant buildings rising out of the mist. hi sam, How long that is taking to render ??? NatEast looooooooooooooooooooool, the fog definitely adds to the atmosphere, I'm already beginning to get that indescribable feeling from looking at it. Connect a 3D Fractal texture (or 3D Cloud) to the transparency channel for the fog. This will add variance to the fog. You can also achieve a similar result using the density channel too. Once you've added the 3D Fractal or Cloud you can change its scale using the '3D Placement' node.